Cut turnip into half-moon slices about 1/4-inch thick. Lay slices on the baking sheet, and sprinkle with salt. Flip slices, and bake until tender on the inside and slightly crispy on the outside, about 12 more minutes. Meanwhile, bring a skillet sprayed with nonstick spray to medium-high heat. Add bell pepper and onion, and sprinkle with garlic powder and black pepper. Cook and stir until softened and lightly browned, about 6 minutes. Closely arrange turnip slices in the center of the baking sheet. Evenly top with cooked pepper and onion, and sprinkle with cheese. Bake until cheese has melted, 1 - 2 minutes. 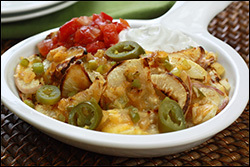 Top with sour cream and salsa, and dig in! 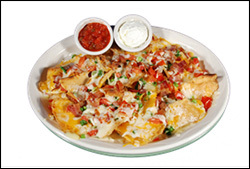 Irish nachos are like a delectable fusion of traditional nachos and potato skins: thinly sliced potatoes (typically fried) topped with melted cheese, sour cream, and more. Upon reading this description, you're likely to reach two conclusions -- 1) they must be DELICIOUS, and 2) they're definitely WAY high in calories and fat. You're right on both counts, smarty pants! Just take a gander at the average stats below. BRUTAL. But the good news is that we know a way to soar right over that nutritional hurdle. Enter TURNIPS! We sliced one up in place of spuds, and then baked it. Add on some smart yet flavorful toppers, and you've got a delicious dish that nobody will want to -- or need to -- resist. Now THAT's worth smiling about! Junk-food cravings don't stand a chance with recipes like THIS around -- click "Send to a Friend" to satisfy cravings everywhere! Happy, happy National Boston Cream Pie Day, a.k.a. October 23rd. Craving some adorable little cream-filled cupcakes? Your wish is our command!